WASHINGTON – The Satellite Sentinel Project (SSP) has confirmed the burial of human remains, some of them in body bags or tarps, through a series of DigitalGlobe satellite images taken of two newly discovered mass grave sites in Sudan’s restive South Kordofan region. The addition of the two new mass graves brings the total discovered by SSP to eight. The Sudanese Red Crescent Society (SRCS) excavated mass graves and filled them with corpses in South Kordofan, according to evidence gathered by SSP. The evidence includes eyewitness reports obtained by SSP, and statements from the SRCS, substantiated by DigitalGlobe satellite imagery. In addition, SSP’s report includes an official SRCS photo of the body disposal team, and notes that SRCS pre-positioned at least 415 body bags and 2,000 plastic tarps in South Kordofan before the fighting began. Acting on instructions from the State of South Kordofan, the SRCS used an excavator to dig and cover large pits. In some cases, eyewitnesses reported, SRCS workers poured fuel on dead bodies and set them on fire. The US government has stated in the July 20 edition of The Washington Post, “What they identify as body bags, we see those same items in those same places before the fighting started.” The US government has released no eyewitness report or imagery in support of its assertion. 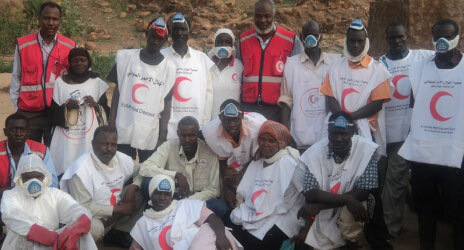 An official SRCS photo taken on June 27 shows the executive director for the organization’s South Kordofan branch, Mireikha Aldow Mireikha, with members of the SRCS body disposal team, some of whom are wearing masks or gloves. Sudanese media has quoted South Kordofan Governor Ahmed Haroun, who is wanted by the ICC on charges of genocide in Darfur, as saying that he instructed the SRCS to dispose of the bodies. "Eyewitnesses have described to SSP seeing a yellow front-end loader with a backhoe digging mass graves in and around Kadugli at sites in which an SRCS Land Cruiser and SRCS workers were also present. One eyewitness described a yellow excavator digging two pits at a site where men dressed in a manner consistent with SRCS workers subsequently threw bodies into the pits. These eyewitness reports, obtained by SSP, are consistent with a statement to the press by the executive director of the South Kordofan branch of SCRS that the locality of Kadugli provided the SRCS corpse management team with 'a loader for excavation.' "
The SSP report also shows what appears to be a yellow front-end loader with a backhoe, less than a kilometer from an apparent mass grave, consistent with what eyewitnesses reported to SSP. In addition, SSP has confirmed UN reports of six Government of Sudan security checkpoints on roads in and around South Kordofan’s capital of Kadugli. Physicians for Human Rights (PHR) has reviewed the recent Satellite Sentinel Project (SSP) imagery of alleged mass graves in Sudan. According to the review by Stefan Schmitt, director of PHR’s International Forensic Program, the images provide credible evidence of possible mass graves and require a full and comprehensive forensic investigation. “To help determine the nature of mass graves, we need to know if the victims were soldiers or civilians and how and why they died. Proper exhumations and examinations would give us this information. PHR is prepared to provide forensic experts in support of an independent investigation into mass graves in South Sudan,” said Schmitt. The Satellite Sentinel Project, http://satsentinel.org, combines satellite imagery analysis and field reports with Google’s Map Maker to deter the resumption of full-scale civil war between North and South Sudan. Not On Our Watch provided seed money to launch SSP. The Enough Project contributes field reports and policy analysis, and, together with Not On Our Watch and our SudanNow partners, pressures policymakers by urging the public to act. Google and Trellon collaborated to design the web platform. Harvard Humanitarian Initiative provides research and leads the collection, human rights analysis, and corroboration of on-the-ground reports that contextualizes the imagery. DigitalGlobe provides satellite imagery and additional analysis.